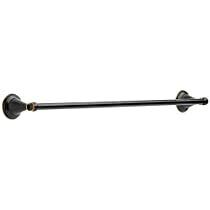 Fluidmaster's universal premium tank lever arm easily adjusts to fit front, side and angle mount toilets. This tank lever arm fits Fluidmaster Premium Tank Levers only (671, 672, 673, 674, 675, 677 and 678) which are sold separately. In case you want to switch out a premium tank lever at a later date, you will not need to purchase the arm again. Functional simplicity & design in a "click"
This is a review of the tank lever arm with the contemporary chrome handle. After the cheap plastic handle of my toilet suddenly broke, I decided to get something that is a bit better quality and so I settled on this particular handle, Unfortunately, because I couldn’t just buy a handle that would work for the lever arm already inside the toilet, I also purchased the matching lever arm. Although this was a buck or so cheaper, I bought this locally mainly because I needed the replacement right away. The handle itself is definitely better quality being made of metal as opposed to the plastic handle I had previously on the toilet, although the handle is a bit more expensive (11 to 12 dollars) than other complete handle sets as it is sold without the required lever arm that is an additional 5 to 6-dollar cost. To my surprise, the lever arm is made completely of plastic as opposed to metal like the handle, however the lever arm seems solid and well-made and unlike metal won’t corrode in the toilet. In addition, both the lever arm and handle carry a five-year warranty, which means at that it will last longer than the plastic one that broke or at least be replaceable under warranty for five years. The installation instructions are clear with good illustrations and the installation itself was very easy and quick. Installation took me less than five minutes to put into the toilet and attach the handle. Most of the parts just click and lock together. The lever arm also has a flip lock adjustment that helps to align the arm over the flapper. Although I didn’t have to adjust the flapper chain or make any further adjustments, you might have to either shorten it or do some additional adjustments with the lever arm, depending on the type of toilet (The brand of my toilet is Sterling). The only issue I personally have is that the handle trim piece doesn’t sit quite as flush as I would like but this isn’t really a problem with the handle but is more because of the location of the handle slot and the toilet tank design which is slightly rounded where the handle attaches. Once the tank lid is on, it really isn’t noticeable. The handle and mechanism fits solidly together and the flushing mechanism works like new. The problem with most tank lever arms is that you have to hold the hand crank down several seconds before you get a complete flush. If you just press and release, the flapper will not go straight up and you will only get a partial flush. I am an engineer and the reason for this has frustrated me. I must have reviewed 30 toilet flapper levers for my side flush tank. Some required bending the lever which might work but none seemed acceptable until I found this gem. The video shown on this website shows the adjustable flexibility for a front flushing tank, which is impressive, but I didn’t know if it would also work for a side flushing tank. (Fluidmaster, please remake that video showing what happens during a flush for both a front, corner and side mount video using your see through tank). The suggestions for other levers about keeping only a little slack in the chain did not solve the problem but what will? After trial and error tests, I found that the lever should be positioned at about a 45 degree angle downward for both a front and side installation and toward the front of the tank. The chain length is much shorter in this position which is the key of why this works. The result is that with 1/4 turn push of the tank handle, the flapper jumps straight up immediately and you get a complete flush. Push the handle down and the lever goes up. Pretty straight forward. Handle on the left side of the tank pointed to back of tank. Push the handle down and the lever goes into a counter clockwise arc when viewed from the perspective of the handle. The shorter the chain, the shorter the arc and the less you have to push down on the handle. With a long chain, the lever may hit the top of the toilet and/or the flapper may only go part way up. This design is impressive and work well. Solid lever, no screws, just snap and go! 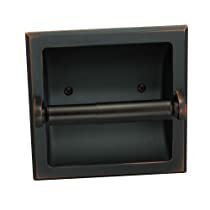 Sturdy plastic lever and pieces snap and lock into place when installing. I was fed up with the cheap levers and the headaches of a loose arm screw messing up the flush. The metal bar had a mind of it's own and guests would leave the bathroom saying the toilets still running. This piece works great so far on my left side/front style Mansfield toilet. Took 10 min. to install and directions are top notch. I got it right on the first try. So far no flapper being caught up like I had before. Hope it stays that way. Note: You'll need to purchase a handle separately that fits this arm by Fluidmaster. The threads are made for each other. UPDATE: 6 months later and the lever is working like a champ. I've caught my 2 year old tugging on the handle and the quality product has taken her abuse with no harm. I'll never go back to the old style. Buy this!